These maps are part of the MGS "State Map" series; scales are 1:500,000 to 1:1 million. Geologic classification of the hydrogeologic (water-bearing) units for Quaternary (surficial, unconsolidated) deposits. 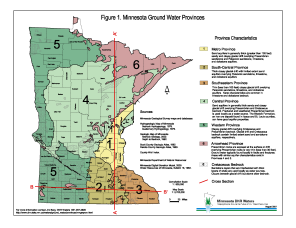 Minnesota has been divided into six ground water provinces based on bedrock and glacial geology that influence ground water availability. Points have been field-verified and digitized or GPS'd. Wellhead protection maps, nitrate probability maps and reports, and geospatial data for topics such as class 5 sensitivity, drinking water supply management areas and their vulnerability, emergency response areas, source water assessment areas, and wellhead protection areas. A generalized interpretation of ground water contamination susceptibility for the state, based on modeling using data inputs from 40-acre gridcell soil and geology data, with additional geology inputs (note: DNR has posted procedures for determining near-surface pollution sensitivity maps). Water use permit information reports, location map and shapefiles of water appropriation installation locations. Collection of dye input points, inferred groundwater flow vectors, descriptive attribute data, and springshed delineations. The project is creating a database and online map of spring locations. Described on MnGeo's geology information website. See especially "Part B" which covers hydrogeology and ground water sensitivity information. Lists localized studies, maps and reports, some including GIS data. 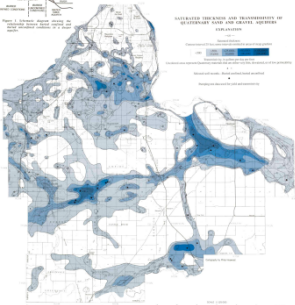 The Metro Model is a regional ground water flow model encompassing the Twin Cities seven-county Metropolitan area. The hydrogeologic investigation focuses on detailed characterization of the Upper Cambrian aquifer commonly referred to as the “Franconia-Ironton/Galesville” or “FIG” aquifer. GIS data includes DEMs of selected bedrock surfaces and shapefiles of bedrock geology, bedrock topography, faults and unit boundaries. Information, data and grids describe the subsurface geology and the groundwater recharge potential of a subarea of the glacial geology map. Links to karst information are on MnGeo's geology information website. This report, accompanying maps and 3D model depict the sediments and rocks that host ground-water systems across this region. GIS data includes point layers for drill holes, geologic material samples and other site information; other layers used to generate surficial and bedrock geology maps; and DEM models of stratigraphic units.